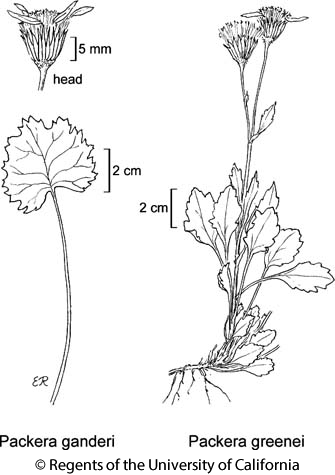 Habit: Perennial herb 2--3+ dm, from unbranched horizontal to erect rhizomes (occasionally stoloniferous). Stem: 1, irregularly tomentose. Leaf: basal and proximal cauline petioled, 2--5 cm, 2--4 cm wide, +- round, ovate, oblanceolate, or diamond-shaped, tapered or obtuse at base, coarsely dentate to crenate-dentate, generally +- red on abaxial face; mid-cauline gradually or abruptly reduced, widely wing-petioled, clasping, obovate, irregularly dentate; distal sessile, linear to lanceolate, entire. Inflorescence: heads radiate, 1--3+; phyllaries 21, 8--10+ mm, green (tips occasionally deep red), tips sparsely tomentose. Ray Flower: 8--10(13); ray 8--15+ mm, red-orange. Disk Flower: 35--65+. Fruit: 4--5 mm, glabrous. Chromosomes: 2n=40,46,92. Citation for this treatment: Debra K. Trock 2012, Packera greenei, in Jepson Flora Project (eds.) Jepson eFlora, http://ucjeps.berkeley.edu/eflora/eflora_display.php?tid=77387, accessed on April 21, 2019. KR, NCoR. Markers link to CCH specimen records. Yellow markers indicate records that may provide evidence for eFlora range revision or may have georeferencing or identification issues. Purple markers indicate specimens collected from a garden, greenhouse, or other non-wild location.